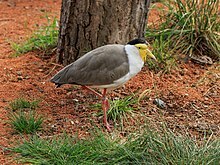 The masked lapwing (Vanellus miles), also known as the masked plover and often called the spur-winged plover or just plover in its native range, is a large, common and conspicuous bird native to Australia, particularly the northern and eastern parts of the continent, New Zealand and New Guinea. It spends most of its time on the ground searching for food such as insects and worms and has several distinctive calls. There are two subspecies; the southern novaehollandiae has distinctive black markings on the shoulder and side of the chest, and is sometimes recognized as a separate species, the black-shouldered lapwing (Vanellus novaehollandiae). These brown-black, white and yellow plovers are common in Australian fields and open land. The masked lapwing was described by the French polymath Georges-Louis Leclerc, Comte de Buffon in his Histoire Naturelle des Oiseaux in 1781. The bird was also illustrated in a hand-coloured plate engraved by François-Nicolas Martinet in the Planches Enluminées D'Histoire Naturelle. This was produced under the supervision of Edme-Louis Daubenton to accompany Buffon's text. Neither the plate caption nor Buffon's description included a scientific name but in 1783 the Dutch naturalist Pieter Boddaert coined the binomial name Tringa miles in his catalogue of the Planche Enluminées. The type locality was originally given in error as Louisiana. The locality was re-designated by the Australian ornithologist Gregory Mathews in 1912 as Timor Laut (the Tanimbar Islands). The current genus Vanellus was erected by the French zoologist Mathurin Jacques Brisson in 1760. Vanellus is the Modern Latin for a "lapwing". It is a diminutive of the Latin vanus meaning "winnowing" or "fan". The specific epithet miles is the Latin for "soldier". V. m. novaehollandiae Stephens, 1819 - southern Australia, New Zealand. This taxon was formerly known as the spur-winged plover. 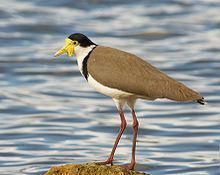 The Handbook of Birds of the World treats V. m. novaehollandiae as a separate species, the black-shouldered lapwing (Vanellus novaehollandiae), even though the two subspecies intergrade in northern Queensland and the Lake Eyre basin. The birds have a wide range of calls which can be heard at any time of the day or night: the warning call, a loud defending call, courtship calls, calls to its young, and others. Since this bird lives on the ground it is always alert and even though it rests it never sleeps properly. Masked lapwings are most common around the edges of wetlands and in other moist, open environments, but are adaptable and can often be found in surprisingly arid areas. They can also be found on beaches and coastlines. Vanellus miles novaehollandiae spread naturally to Southland, New Zealand in the 1930s and has now spread throughout New Zealand, where it is recognised as a self-introduced native and known as the spur-winged plover. A masked lapwing blinking the left eye (the nictitating membrane is used rather than the eyelids). Note origin of the membrane from the medial canthus. Masked lapwings are shy and harmless in summer and autumn but are best known for their bold nesting habits, being quite prepared to make a nest on almost any stretch of open ground, including suburban parks and gardens, school ovals, and even supermarket carparks and flat rooftops. They can be particularly dangerous at airports where their reluctance to move from their nesting area – even for large aircraft – has resulted in several bird strikes. Breeding usually happens after winter solstice (June 21), but sometimes before. The nesting pair defends their territory against all intruders by calling loudly, spreading their wings, and then swooping fast and low, and where necessary striking at interlopers with their feet and attacking animals on the ground with a conspicuous yellow spur on the carpal joint of the wing. The bird may also use tactics such as fiercely protecting a non-existent nest, or a distraction display of hopping on a single leg, to attract a potential predator's attention to itself and away from its real nest or its chicks after they have commenced foraging. There seems to be some significant use of language to guide chicks during a perceived dangerous situation. Long calls seem to tell the chicks to come closer to the calling bird; a single chirp every few seconds to ask them to move away. There is a much-believed but incorrect myth that the spur can inject venom. The myth may have been based on fear of the masked lapwing's territorial behaviour. Attacks are most vicious on other birds such as ravens, and also on cats and dogs, but once the chicks reach 60% of full size after 2–3 months, the chances of this happening decrease. Strikes are much rarer on humans since they are more aware. Sometimes the bird can damage its wing in a strike but usually survives and is flightless as the wing heals. Some masked lapwings, especially those that live in residential suburban areas, may never successfully breed due to increased disturbance from domestic pets, people on footpaths and cars. Commonly two birds are seen together, a male and a female which are almost identical. Many also can be seen in groups at times, especially during feeding on coastlines. The chick reaches full growth after 4 to 5 months and will often stay with the parents for 1 to 2 years resulting in family groups of 3 to 5 birds nesting in one location over the summer. The birds spend much of the time on the ground, searching for worms and insects to feed on. Southern race facial detail. Also shows wing spurs. ^ BirdLife International (2012). "Vanellus miles". IUCN Red List of Threatened Species. Version 2013.2. International Union for Conservation of Nature. Retrieved 26 November 2013. ^ Buffon, Georges-Louis Leclerc de (1781). "Le Vanneau armé de la Louisiane". Histoire Naturelle des Oiseaux (in French). Volume 15. Paris: De L'Imprimerie Royale. p. 103. ^ Buffon, Georges-Louis Leclerc de; Martinet, François-Nicolas; Daubenton, Edme-Louis; Daubenton, Louis-Jean-Marie (1765–1783). "Vanneau armé, de la Louisiane". Planches Enluminées D'Histoire Naturelle. Volume 10. Paris: De L'Imprimerie Royale. Plate 835. ^ Boddaert, Pieter (1783). Table des planches enluminéez d'histoire naturelle de M. D'Aubenton : avec les denominations de M.M. de Buffon, Brisson, Edwards, Linnaeus et Latham, precedé d'une notice des principaux ouvrages zoologiques enluminés (in French). Utrecht. p. 51, Number 835. ^ Peters, James Lee (1934). Check list of Birds of the World, Volume 2. Cambridge Mass. : Harvard University Press. p. 239. ^ Mathews, G.M. (1912). "A reference-list to the birds of Australia". Novitates Zoologicae. 18 (3): 171–455, in particular page 215. ^ Brisson, Mathurin Jacques (1760). Ornithologie, ou, Méthode contenant la division des oiseaux en ordres, sections, genres, especes & leurs variétés (in French and Latin). Volume 1. Paris: Jean-Baptiste Bauche. p. 48. ^ Brisson, Mathurin Jacques (1760). Ornithologie, ou, Méthode contenant la division des oiseaux en ordres, sections, genres, especes & leurs variétés (in French and Latin). Volume 5. Paris: Jean-Baptiste Bauche. p. 94. ^ Jobling, James A. (2010). The Helm Dictionary of Scientific Bird Names. London: Christopher Helm. pp. 255, 398. ISBN 978-1-4081-2501-4. ^ Gill, Frank; Donsker, David (eds.). "Buttonquail, plovers, seedsnipe & sandpipers". World Bird List Version 5.4. International Ornithologists' Union. Retrieved 9 December 2015. ^ a b "Masked Lapwing Fact Sheet, Lincoln Park Zoo"
^ "Spur-winged plover". New Zealand Birds Online. Retrieved 10 December 2015. ^ "Masked Lapwings: Managing bird strike risk at Australian airports" (PDF). ATSB Bird Information Sheet No.3. Australian Transport Safety Bureau. Retrieved 13 May 2011.